This blog doesn’t recommend financial products, and Finhabits has advantages and disadvantages over competing apps. The app’s management fee is slightly higher than some, according to expert reviews. 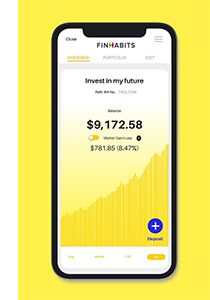 Nevertheless, Finhabits follows sound principles, such as investing in low-cost index funds. The Washington state government chose Finhabits as one of its vendors to provide a retirement plan through the state’s Retirement Marketplace for small businesses. Finhabits courts customers through partnerships with credit unions serving Latino neighborhoods in Chicago and New York. It also hosts live marketing events in Spanish on Facebook and YouTube. The firm charges a fee equal to 0.5 percent of the assets in the retirement accounts to manage them internally. But savers with less than $2,500 pay $1 per month, so an account with $1,000 costs them 1.2 percent. In addition, the customer pays between 0.07 percent and 0.11 percent of assets to the financial firm that invests the customer’s money in the index fund. The average fee for all index funds is 0.09 percent. A competing app, WealthFront, has a lower management fee – 0.25 percent of assets – but its investment fees range from 0.07 percent to 0.16 percent. A final concern that some have expressed about Finhabits is its limited number of investment options. But Garcia has a good argument for this: simplicity is the best way to encourage saving among people who aren’t in the habit.